A registered user that pays a subscription fee for our services and has access to all of the features that we provide. Usually that person is the CEU administrator or manager for the company of an approved CEU courses. A registered user that was added by a Subscriber to be their approved Instructor for CEU Courses. 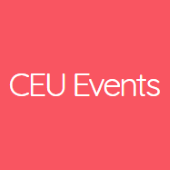 A person that was invited to attend the CEU event scheduled by the Subscriber or Instructor. A registered user (showroom, representative or manufacturer) that pays subscription fees for access to our CEU Original Series™ presentations.